FREE FREIGHT - In the continental USA! The Complete BigSprinkler Irrigation Kit ready to set up and start irrigating from your pond, reservoir, or stream in minutes! This kit includes our 1000F Sprinkler Cart that is capable of up to 120 ft. diameter wetted circle, 15 ft. of 2" suction hose with strainer, 100 ft. of heavy 1.5" discharge hose with quick connects, and a heavy duty gas driven pump. FREE FREIGHT - In the continental USA! The 1250K Complete BigSprinkler Irrigation Kit is ready to set up and start irrigating from your pond, reservoir, or stream in minutes! This kit includes our Sime 15 to 50 gallon per minute K1 sprinkler on our heavy duty wheeled cart capable of up to 150 feet diameter wetted circle, 15 feet of 2" suction hose with strainer, 100 feet of premium 2" discharge hose with quick connects, and a heavy-duty, high-pressure pump. FREE FREIGHT - In the Continental USA! 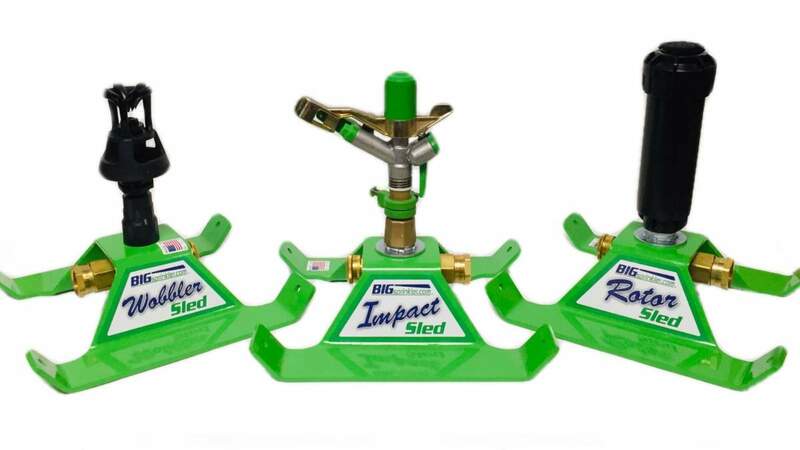 The 1500H Complete BigSprinkler Irrigation Kit is the next step up from our 1250K kit and includes the Hidra sprinkler on our NEW 1500H heavy duty sprinkler cart that is capable of between 30 and 140 gallons per minute flow rate! This kit is capable of covering up to a 200 foot diameter wetted circle! The kit includes, 15 feet of 3" suction hose with strainer, 100 feet of premium Heavy Duty 2" discharge hose with quick connects, 1500H sprinkler cart and a heavy-duty 9hp high-pressure pump. FREE FREIGHT - In the continental USA! Large capacity 2000S Irrigation Kit for irrigation projects requiring big performance coverage! Pump from a pond, reservoir, stream, or lake with this high-pressure Kohler Irrigation Pump. This kit includes our 2000S large volume sprinkler cart capable of up to 250 feet plus diameter wetted circle, 15 feet of 2.5" suction hose with strainer, 200 ft. of premium 2" discharge hose with quick connects, and a heavy duty high-pressure irrigation pump.